So, my (unofficially adopted) daughter recently announced her engagement to a wonderful man. They described their happiness as “having a rainbow unicorn vomit” on them. Now that’s happy! Anyway, they decided on a Dr. Who/Steampunk-themed wedding. I did some research online to help with some suggestions for ideas for everything from the gown to flowers to invitations to the cake. Apparently, it’s not all that uncommon a theme, especially among geeks such as our daughter and her groom. This is a good thing, since it offers more food for thought, and lots of eye-candy! I looked for large bags of bulk buttons in the color scheme I needed, but I couldn’t find anything locally that really fit the bill. So, I bought some Sculpey polymer clay, some tools, and a few small bags of buttons in the colors I needed. Okay, I bought a bunch of other stuff I didn’t really need for *this* project, but hope to use in the near future. Oh, and I also bought some lace and tulle, because I still have a few ideas to try out. According to a few of the sites I found that belong to people who make button bouquets, several people use 100 stems for each bouquet. If you’ve never worked with polymer clay before, I’m discovering that it can be quite heavy, compared to regular plastic buttons, especially when used to create larger base buttons. I’m still not sure that I will use the full 100 stems, but I have a couple of ideas to help fill it out without adding much weight. 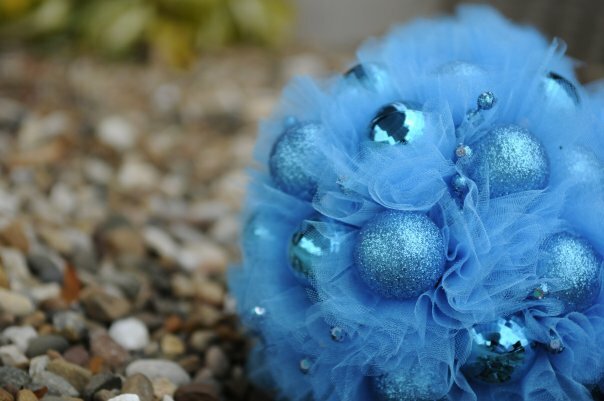 I’m thinking that I could use the tulle as a spacer between the cool button stems, similar to the example above. I had 12 stems, and a bunch of Sculpey buttons. It was a beautiful morning, so I was working outside. Did I think to put on sunscreen? No, of course not! So now, I have a slight sunburn. First of the season! Luckily, it doesn’t hurt or itch. Yet. I like the way that these are unique, to include many hand-made buttons, abalone buttons, as well as vintage buttons and some steampunk gears and such. I’ll try to remember to post the tutorial in the near future, as well as the completed bouquet.